This article from the Star Tribune detailed an aerial count over the weekend that found 38 active bald eagle nests, two more than last year, in the 72-mile stretch from Dayton to Hastings that makes up the Mississippi National River Recreation Area. The last published state-wide bald eagle nest survey in 2005 found 1,312 active bald eagle nests in the state of Minnesota. 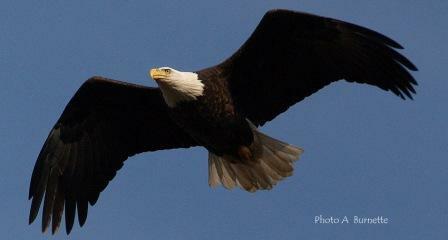 You can read more about bald eagles on the MNDNR's website, including their documented population decline. TRC educates the public on how spent lead from ammunition, present in the carcasses and gutpiles of white-tailed deer, continues to be an important source of lead exposure for bald eagles.